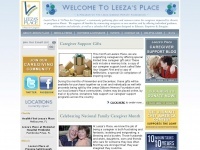 Leeza's Place is a Place for Family Caregivers, a community gathering place and resource center committed to providing free support services, resources and programs for family caregivers taking care of a loved one with a memory disorder or any chronic and/or progressive illness. Leeza Gibbons created The Leeza Gibbons Memory Foundation in 2002 as a promise to her mother to tell her story and make it count after her diagnosis of Alzheimer?s disease and her family's subsequent caregiving challenges. Leeza's ..
Der Webserver von Leezasplace.org wird von GoDaddy.com, LLC betrieben und befindet sich in Scottsdale, USA. Es werden eine Vielzahl von Websites auf diesem Webserver betrieben. Der Betreiber nutzt diesen Webserver für viele Hostingkunden. Insgesamt werden mindestens 180 Websites betrieben. Die Sprache der Websites ist überwiegend englisch. Nur sehr wenige Websites auf diesem Webserver sind nicht jugendfrei.